When you’re sailing in the Mediterranean, you have access to live lobsters and fresh caught fish. 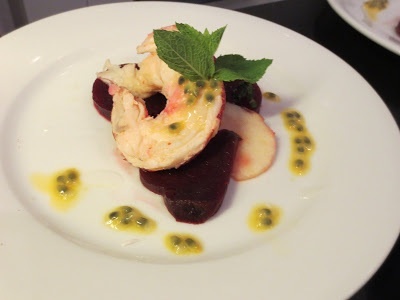 With such sublime seafood, you don’t want to bury it in cream sauces or anything fussy. Try split lobster tails spread with pesto or tapenade and broil in the oven. Mussels are also great served this way – a la provençale. Spread honey and whole grain mustard on filets of branzino or monkfish and bake in the oven. 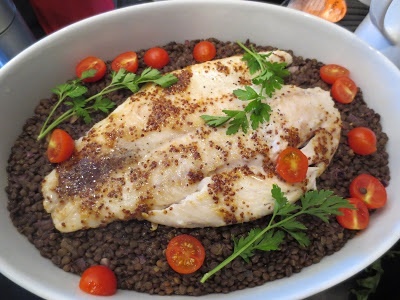 Serve on a bed of lentils cooked with preserved lemons then garnish with olives amd fresh cherry tomatoes. In the evening, for a tropical flair, grill scallops and serve with a kiwi and mango compote and passion fruit beurre blanc sauce. The delicious bounty of the ocean just needs a simple mixed salad and fresh crusty bread to make a simple yet fabulous Mediterranean spread. Bring a large stockpot of water to a rolling boil and whole live lobsters (as many as you can fit). Cover and let cook for about 20 minutes. Remove from water with tongs; reserve cooking liquid. Let cool and tear off tail and claws; discard the rest. Use a sharp knife or kitchen shears to split tail down the middle. The back of a heavy cleaver works great for cracking the claws. Spread your favorite pesto or tapenade or even puréed sun dried tomatoes on the lobsters with a knob of butter and place under broiler for 5 minutes. Serve with a wedge of lemon. Heat a thick-bottom sauté pan or grill. Clean and dry each scallop. Sprinkle fresh ground pepper on both sides. Add butter or oil to Pan and sear scallops for about 2 minutes on each side (look for crusty golden caramelised color). Meanwhile, cut kiwi and mango in small cubes, and add 1/4 red onion or one shallot. In a small saucepan, heat equal amounts of white wine and orange juice. When it comes to a boil, add small chunks of cold and unsalted butter gradually to the mixture and whisk until dissolved. Keep adding butter until sauce is creamy and tastes buttery. Add salt and pepper to taste. Use a spoon to make a circle of sauce on plate, add compote, then top with 3 scallops and garnish with half a strawberry.